1 of 1 In a food processor, combine flour, butter, sugar and salt. Pulse until butter resembles coarse crumbs (a few larger pieces are okay). With machine running, stream in 2 tbsp ice water, about 20 seconds. Check to see if dough has come together. If it seems dry, add ice water 1 tbsp at a time with machine running, being careful not to make dough too wet. Do not overmix. Transfer dough onto a work surface, form into a disk, wrap in plastic and refrigerate for 1 hour. 1 of 2 Heat oven to 375 degrees . 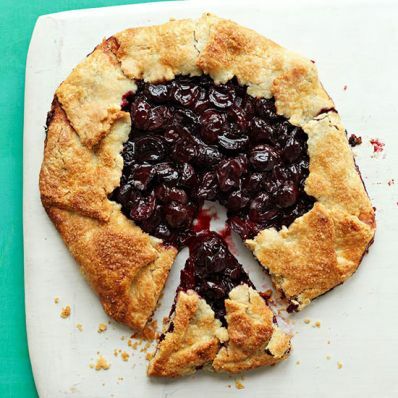 In a bowl, combine cherries, sugar, cornstarch, lemon juice, almond extract and salt. Set aside. 2 of 2 On a lightly floured surface, roll out chilled dough to a 13-inch circle. Transfer dough to a baking sheet lined with parchment paper. Pour filling into middle of dough, leaving a 2-inch border around edges. Fold edges over filling (galette should be 9 inches wide when complete). Brush border with cream and sprinkle with sugar. Bake at 375 degrees for 50 to 55 minutes, until crust is golden brown. Cool on a wire rack before slicing. Per Serving: 661 mg sodium, 4 g fiber, 29 g pro., 528 kcal cal., 16 g Fat, total, 72 mg chol., 4 g sat. fat, 65 g carb.